Confessions of an ADD English Teacher: woot! i won! i won! I never win anything. I'm like the biggest loser of entering contests. I entered a drawing over at the Psychotic Housewife's blog and I was the random winner. This is a great blog for finding deals and coupons and I just love reading her each week. Anyway, she had a drawing for a give-away from a great new clothing company called Ufadili. The company is really cool giving 30 percent to charities. It's the kind of place any crunchy granola types would support. You know, my kind of people. Also, since it's Monday ... at least somewhere ... 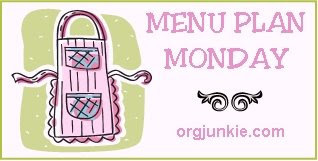 It's time for my weekly menu. DH was pretty happy to see there's not chicken anywhere on the menu this week. He's getting pretty burned out on chicken. I make pecan crusted tilapia...we LOVE it! I've not tried it with coconut....hmmmm, yet!